: Ph.D student in Finance at the University of Nairobi. : MBA (Marketing) at the University of Nairobi. : Certified Public Secretary (Kenya). : BA (Hons) in Economics, at the University of Nairobi. Founder and chairman of an investment firm Royal Capital Ltd (2011) and Legislative and Governance Institute (NGO), 2012. – Member of Parliament for Maragua in Murang’a County. – Lecturer in Business, Marketing courses at USIU, Nairobi. – Director and CEO of a marketing and publishing firm, Royal Communications (K) Ltd.
– Economist with the Ministry of Planning and Development. – Busy offering advisories to County Governments and training members of County Assemblies viz:Trained MCAs of Isiolo, Samburu, Mandera, Kajiado, Nakuru and sampled members of budget committees from various other counties.- Director of Global Centre for Training and Development Consortium Ltd.
Facebook: Hon Elias Mbau. The Budget Guru. Kudos Moses Kuria member for Gatundu South. I know your opinions and statements have not always attracted the support and admiration of all but I beg to urge right-thinking members of our Kenyan society to take a quick breath and reflect on the proposals and ideas published in Sunday Standard of 3rd Jan 2016. The philosophical underpinning of the concept of devolution, also in other contexts called decentralization is to bring services closer to the people and enhanced efficiencies in the ways scarce resources are allocated, the manner in which decisions on priority projects are arrived at, the participation of the local communities to ensure accountability and value for money by the executive and eventually, embrace and own the projects/programs for future sustainability. Whereas the constitution on Article 179 vests the mandate of implementation of projects to the governor and his executive committee, the key Law that operationalizes this part of the constitution, the Public Finance Management Act, 2012, requires in section (3) that these officers are accountable to the public through Parliament and County Assemblies. Whereas I agree with the writer that ‘a governor can decide on how to spend the money as he walks’, the million dollar question is: who is supposed to ensure adherence and compliance with the laws, procedures and regulations? John Coolidge (1933) said that “nothing is easier than spending public money. It doesn’t appear to belong to anybody.” County Assembly members, as the first line of representation of public interest as well as legislation of the same are the first port of call in ensuring accountability and prudent use of public resources. How well or effective those honorable members play out this mandate is a subject for another day. The County government Act section (104) and Public Finance Management Act section 126 requires that every county government shall prepare a development plan every financial year which shall guide the budgeting and execution activities for that year. That particular development plan of a county is approved by the county assemblies as a guide to which sectors are going to receive allocations. Assembly members, the general public as well as other stakeholders are thereafter expected/mandated by the constitution and other statutes to play an active oversight role during the processing of budget items as well as during implementation. The law gives every citizen a right to stand up, even go to court and demand compliance with the law, or the rights of the public to be preserved, promoted and protected. In the year 2016, what all organs of oversight need to do and must do is to ensure that every county produces and publishes its annual development plan which should become available to the general public. County Assembly members and Controller of Budget must play by the law and ensure that they do not fall prey in conspiring to plunder public resources. The constitution and other statutes are very clear on the imminent consequences of those officers who breach it. I’m reminded of the case facing the governor of Isiolo County who purported to implement an appropriation law which had not been processed and approved by the Assembly. Many others are facing cases and allegations of impunity and integrity issues. The day of reckoning is drawing nigh but there’s still time for redemption. In all this we must continue asking what the apex Oversight organ in Matters County, the senate has done! It is not enough for the Senate to wait for impeachment motions or for the Oversight Committees to await reports of misappropriation to act. More importantly, the Senate should by now have come up with clearly spelt out rules and regulations on how the county development plans are aligned, factored or catered for during the budgeting process and how unbudgeted programs are prioritized to be catered for in subsequent periods when money becomes available. Section (12) of the second schedule of PFM act calls for the implementation of program based budgets. This concept requires the specification of projects, targets, timelines, key indicators, outcomes and funds allocated. The senate must take urgent steps to ensure alignment of this document with the annual development plan and I can assure you that the rest in terms of results/outcomes will just follow naturally! The governors will be grateful to have been guided, the assemblies and other stakeholders will be satisfied with their role and the general public will be going through a ‘feel-good-experience’. Go Moses go!! On the huge wage bill later…. By Hon. Elias P. Mbau. Former MP for Maragua and Current Chairman of CDF Board. Former journalist blames alcohol menace in Murang’a on politicians. FORMER radio journalist Wanjiru Chege has blamed politicians for the rampant alcoholism among the youth in Murang’a. She told the youth to shun those who are using illicit brews to lure them to vote for them in the general election. Wanjiru, who is a women’s representative aspirant, accused some politicians in the region of buying alcohol for the youth to cause violence during campaigns. Speaking at Kamahuha shopping centre in Maragua constituency, Wanjiru urged the youth to shun alcohol “for the sake of their future”. The former journalist said alcoholism has retarded development in Murang’a. 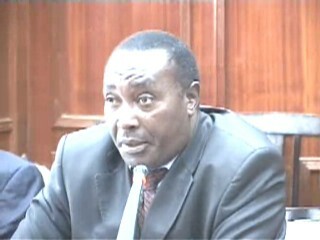 Maragua MP Elias Mbau condemned politicians allegedly misusing the youth to cause violence and attack their opponents. MPs want budget plan tabled early. Parliament’s Budget Committee wants the government to table the policy guidelines for next year’s budget to ensure that the budgeting process stays on schedule. The chairman of the committee, Mr Elias Mbau (Maragwa),told the Speaker that the Budget Policy Statement, which has to be presented to the House, on or before March 21 in every financial year, ought to be tabled to enable the committee execute its duties before Parliament’s term expires on January 14, 2013. Mr Mbau said his team has been in contact with the Treasury seeking the supplementary budget for this financial year, the budget policy statement and the two Bills on sharing of revenue between the county and national governments. Speaker Kenneth Marende asked the government to table the documents next week. MPs break law to give State Sh424 billion. Treasury’s threats that MPs would lose a huge chunk of their mileage allowances Constituency Development Fund kitties if the cuts they recommended are passed worked on the lawmakers. Finance Minister Njeru Githae told MPs to “trust” him and that as soon as the money was approved, he would bring the Appropriations Bill to get the legal authority to withdraw the rest of the budget money from the Consolidated Fund. While the front bench smiled all the way to the Exchequer, the back bench insisted that the Executive had flouted the law and so had the Deputy Speaker. “The budget process as outlined in the Constitution has not been followed. Why are we in a hurry to contravene the Constitution? Did we act in vain when we went round the country collecting the publics’ view on the Budget?” asked Mr. Okemo, the Chairman of the Finance and Planning Committee. Mr Okemo said that without the minister incorporating the changes proposed to the budget by the Budget Committee, which Parliament approved, there was ni business to grant half the budget money. But Mr Githae said his instructions to the Treasury mandarins “to take on board everything that the MPs had said when preparing the Appropriations Bill” were shunted aside. DAILY NATION Friday June 22,2012. Page 35. Githae “ambushes” MPs with sh424 bn request. House team accuses minister of being held hostage by treasury mandarins and trying to blackmail Parliament. Finance minister Njeru Githae has “ambushed” Parliament with a request to withdraw sh424 billion from the Consolidated Fund to run the government. The minister said the withdrawal is a stop-gap measure to access half the budget money pending parliamentary approval of a law that will legalize the withdrawal. The minister wrote to Parliament at lunchtime yesterday and walked to the House an hour later to present his request in a move that raised a huge uproar from the Budget Committee. The members of the House team accused the minister of flouting the Constitution. If the push and pull continues and the MPs stand their ground, they could shut down the government beginning July 1 when the next financial year begins. Or the Treasury could be forced to illegally access the Consolidated Fund and spend money without parliamentary approval. The MPs are also piqued that Mr. Githae has refused to cut domestic and foreign travel expenses in all ministries as recommended by the House. They said that the technocrats at the Treasury were trying to blackmail them to breach the law, yet Parliament had already approved the cuts. “The minister is trying to tell us that this will affect the mileage claims payable to MPs and that the cuts to capital grants will affect the allocation to the Constituency Development Fund. This is the height of impunity,” said Mr. Mbadi. To the MPs, the minister was trying to pull an illegality that his predecessor at the Treasury, Deputy Prime Minister Uhuru Kenyatta, did last year and which the courts ruled as unconstitutional. The MPs insisted that the minister had to bring an Appropriations Bill, taking into account the report of the Budget Committee as adopted by Parliament. CALL TO SPEED UP CHOPPER CRASH PROBE. Inquiry’s Findings Must Also Be Made Public, Demand Mourners During Burial Of Officers. BY SAMUEL KARANJA AND ELISHA OTIENO. Captain Gituanja was buried yesterday at Kiiri Village in Kandara, Murang’a County, in an emotive ceremony attended by thousands of friends, relatives and local residents. Government officials led by two Cabinet ministers, two assistant ministers and MPs were also in attendance. Maragua MP Elias P. Mbau told Mr. Iteere to ensure that the families of the officers were well compensated. Daily Nation, Thursday June 21st, 2012. MPs’ concern over sh1.4 trillion debt. MPs have expressed concern over the management by the government of the sh1.4 trillion public debt. The legislators said the country’s public debt to GDP ratio has increased with the Treasury shifting the target from 42 per cent then 45 and to the current 47 per cent. “This is a worrying trend. Furthermore, public debt has increased on account of maturity of Treasury Bonds. How does Treasury intend to manage debt?” the MPs queried in a report tabled in the House on Wednesday. The report was prepared by the budget committee after it received recommendations from all parliamentary committees which were scrutinizing the 2012/2013 budget. The annual public debt management report by the Ministry of Finance for July 2010-June 2011 indicates that public debt rose by 40 per cent from sh1,059 billion in June 2009 to sh1,487 billion in June 2011. Treasury said in nominal terms, public debt to GDP increased from 46 per cent of GDP to 54 per cent of GDP during the three year period. In the report the MPs have recommended that the country cease payment of “ghost projects” such as KENREN in order to manage public debt. They say the public debt problem has been worsened by failure of the Kenya Revenue Authority to meet its targets. The report, which now awaits debate, notes that Finance minister Njeru Githae explained that Treasury is targeting to bring the debt to GDP ratio to 47 per cent. The Minister also explained that a “self imposed rule” has been put in place by Treasury of not exceeding 50 per cent. The report says the structure of Kenya’s debt is commendable, standing at 50 per cent local debt and 50 per cent external debt. “Members however questioned the prudence of 50 per cent external debt and 50 per cent internal debt, noting that it would be better to externalize debt,” the report tabled by budget committee chairman and Maragua MP Elias Mbau adds. When these concerns were raised, the minister explained that the syndicated loan is a way of externalizing debt. The STAR Friday, June 2012.